This hand-blown rabbit and his petite pewter friend help you keep the promises you've made to yourself. A whole lot cuter than tying a string around your finger, Jill Henrietta Davis's sweet Habit Rabbit serves as a long-eared reminder to reach your goals. Whether you want to break your habit of eating dessert first or start calling your mom more, this hand blown rabbit and his petite pewter friend help you keep the promises you've made to yourself. Want to start drinking more water? Put the glass rabbit next to your water filter or sink and the pewter guy on your desk at work as a reminder to get your recommended amounts of water per day. Need some motivation to go running after work? Nestle him right next to your sneakers and keep his companion in your pocket. A sweet way to cheer on someone else's successes or your own, this long eared duo encourages the user to hop to it and make things happen. Handmade in Rhode Island. Glass rabbit: 2.75" H x 1.25" diam. ; Pewter rabbit: .9" H x .4" diam. Please note: each set contains 1 blue glass rabbit and 1 pewter rabbit. At the turn of the new year I made some changes for the healthier and am rewarded with results. I wanted to buy this habit rabbit as a token of my progress and to encourage myself to keep up my goals. The tiny rabbit fits comfortably in my pants pocket, keeping up with it until the end of the day and putting it up safe for another, is a reminder that achievements are a continuous process. The blue glass rabbit is a surprisingly sturdy and pretty! Pay attention to the product photos: these rabbits are small. 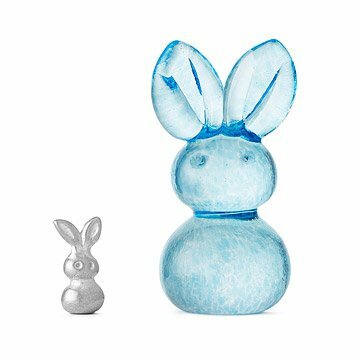 The blue glass bunny is a perfect size to keep on a refrigerator shelf, etc. I keep mine next to my toothbrush so I can see it every morning while I think about the day ahead. I keep the tiny bunny in the little mesh bag that it came with, so I'm less likely to lose it in my pocket or purse. I love my Habit Rabbits! The rabbits are well-made and adorable. What an adorable pair of bunnies, love them! Happy Holidays to you all!!!!!!!! I love rabbits and glass pieces. But I ordered this immediately as I loved the concept. Too many times I get to the end of the day and forgot about the daily tasks that I wanted to make part of my life. I then feel terrible. This is a wonderful idea as I'm very visual and know that having this little reminder on my kitchen sink and in my bedroom will help remind me of what I want to do for me when I'm performing all my other tasks. I really love the idea of this piece. Instead of the annoyance of yourself or others, you can look at this beautiful little bunny to help show you the way. The glass ornament is more solid than anticipated, which is quite nice. I was well aware of the sizes of both the blue glass ornament and the smaller pewter ornament having read the description details. I bought this item as a gift because it was unique and thoughtful. I would recommend this product to anyone who is looking for something sweet and thought-provoking.